The corporative culture of Tm2 is based on 3 fundamental pillars: the safety of our personnel, the greatest quality of our services and all of them always respecting the environment. 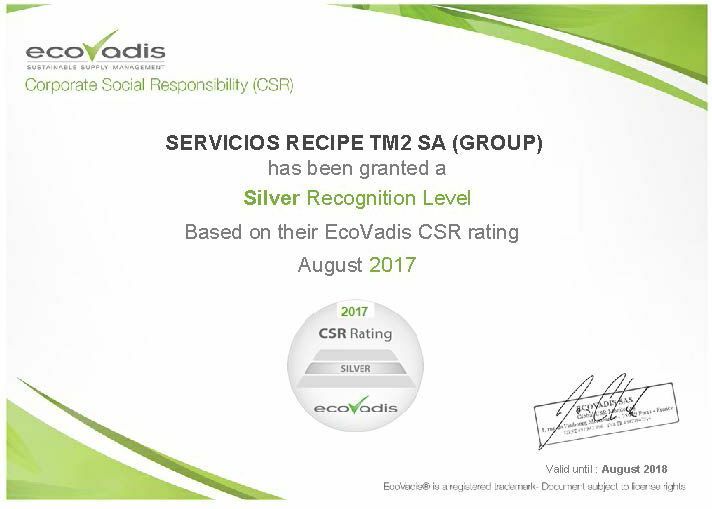 Tm2 has been granted a Silvit Recognition Level based on their Ecovadis CSR rating. 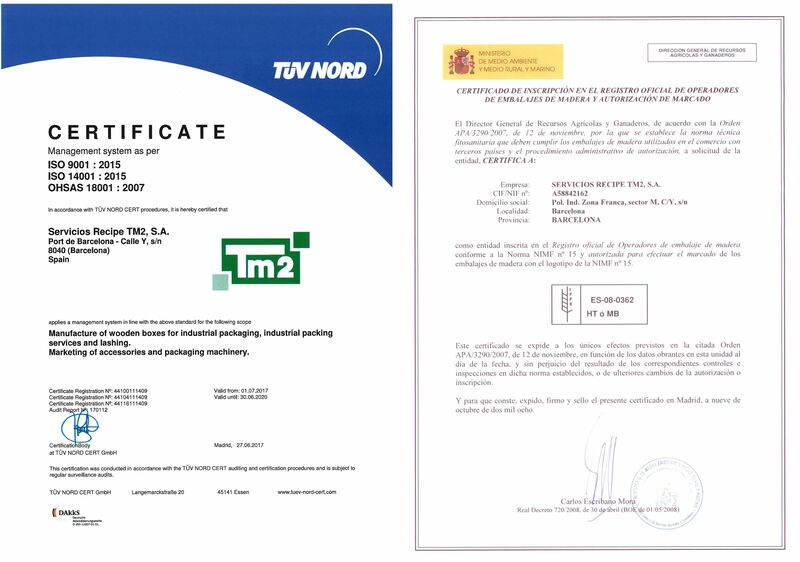 Moreover, since the establishment of standard ISPM15 of the FAO, Tm2 is certified by the Spanish Government as an authorised operator. Servicios Recipe TM2 S.A defines quality, environment and occupational health as a permanent and priority objective. Integrated Management Management of WOODEN BOXES FOR PACKAGING, INDUSTRIAL PACKAGING AND LASHING, MARKETING OF COMPLEMENTS AND MACHINERY FOR PACKAGING consolidates this policy to ensure the highest degree of satisfaction of its customers, promote respect and preservation of the environment and improve occupational health benefits. Quality, environment and occupational health can only be achieved with a team of people who feel strongly the pride of the job well done and to be part of the Company. It is the team and the people that integrate it, who work with those premises and who achieve them by guaranteeing competitiveness, success and continuity. – The maximum satisfaction of their customers. – Attend to their customers, defining quality levels. – Prevention and reduction of pollution of their activities. – Prevention of risks and minimization of nonconformities, incidents and accidents. – The implementation and development of Continuous Improvement. – The establishment of the objectives and goals of quality, environment and occupational health and the monitoring of its evolution. – Compliance with applicable legislation and regulations, both in quality, environment, and occupational health. – The permanent training of all staff. – The support of communication. – Environmental awareness and risk prevention. – The prevention and preservation of the health of all personnel. The Management hopes that this commitment will be assumed and adopted by all employees of the Company and integrated into its work style. Management undertakes to ensure the application of this Policy and periodically review its content, adapting it to the nature of the activities and their impacts and risks, as well as to the general strategy of the company.